Finally! You have decided to make a step further and to place your order. You have made the right choice. You will finally be able to get your cute promotional products…But, there is an important step to make before producing these wonderful items: you have to make a final art proof. This step will define the quality of the final result. Indeed, the production department goes only by the elements indicated on the final proof in order to create a product that will fully correspond to your wish. That is why it is of utmost necessity to carefully check all the details that you see on your final artwork. It is vital for the quality of the picture to be perfect. Take your breath, the explanation is below! A vector graphics is a digital picture. This is the opposite of the matrix image; when we work with matrix pictures we work on the pixels. 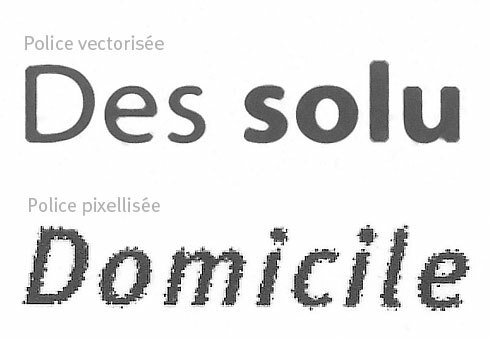 You can change the size of a vector graphics and the quality will be unchanged, contrary to the matrix image that will show the multitude of pixels from which it is made of when you try to enlarge it. Try it on your own; it will be clearer than any explanations or descriptions. When you vectorize a graphics, you actually draw again all the lines, points and other details from which the picture is made of. To do it, you use special software which allows you to work with vectors (vector: right directed segment on which we click to define a point of origin and a point of extremity in order to give it a shape). This can take a lot of time and you have to be very patient. The advantage of a vector graphics is that we can enlarge it without any damage made to the picture, the vector lines will be created through mathematical formula and they are recalculated every time the size is changed. If we take logos for example, they are mainly drawn under the vector form, in order to be able to print them in high definition regardless of their size. That is why it is important to work with this type of files in order to customize promotional products. The more often used softwares for the creation of the vector graphics are Adobe Illustrator, or Macromédia Flash, but there are a lot of others. In any case, no worries: if you cannot provide a vector graphics, either because of lack of time or because you do not have technical skills to do it, the graphic designer will do it with pleasure.